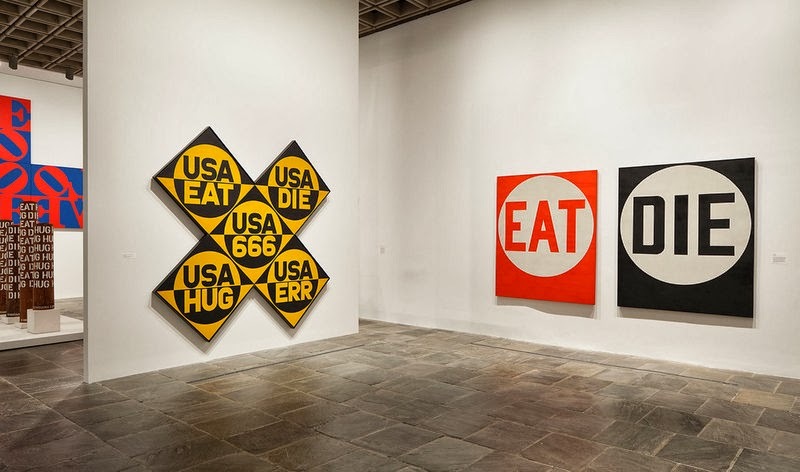 Guest Contributor Jonathan Stevenson / “Robert Indiana: Beyond Love” at the Whitney unabashedly aims to extricate the artist from the public’s myopic reduction of his body of work to the iconic “LOVE” image of the 1970s. It succeeds in presenting Indiana as a brave, erudite, disciplined artist whose worldview is far more nuanced and dappled than those four letters suggest. Impelled by domestic instability and uncertainty to find an anchor – his adoptive parents (the Clarks) divorced when he was eight – Indiana lit upon America and its symbols. These invariably include words, which he embraces insistently and convincingly as visual objects. His take on his country, though anything but loveless, is persistently sardonic and critical. For every opportunity that American robustness affords, there is moral and material risk. Hence the counterpoint, in his American Dream diamond series, between “Take All” and “Tilt.” A Darwinian pall – “Eat” and “Die” – hovers over his vision. Yet his hard-edged visual essays on more particular subjects prove that Indiana is not a simplistic or platitudinous artist. A terrific painting, Year of Meteors, incorporates Whitman’s verse and records both the promise and the tragedy of the Civil War. He deconstructs of Joseph Stella’s soaring Brooklyn Bridge painting by way of a mordant Hart Crane poem. Some paintings explore the travails of homosexuality in an intolerant era. And finally, there is plenty of humor, as in his wry juxtaposition of the maternal breast and the Model T.
If Warhol illuminated the way celebrity and capitalism infiltrated and distorted our perception of reality, Indiana acknowledges this phenomenon and exhorts us to look past the illusions, tune into the political and psychological world around us, and assess it incisively. Indiana’s painting of Marilyn Monroe limns her muted transformation rather than her hypnotic ubiquity. In his confidence that there is some better truth out there than the one we might immediately see, for all its sidelong irony, Indiana’s work is that of a discerning patriot, and fundamentally optimistic. This big and very moving show is one that our roiling times could use, if not demand. 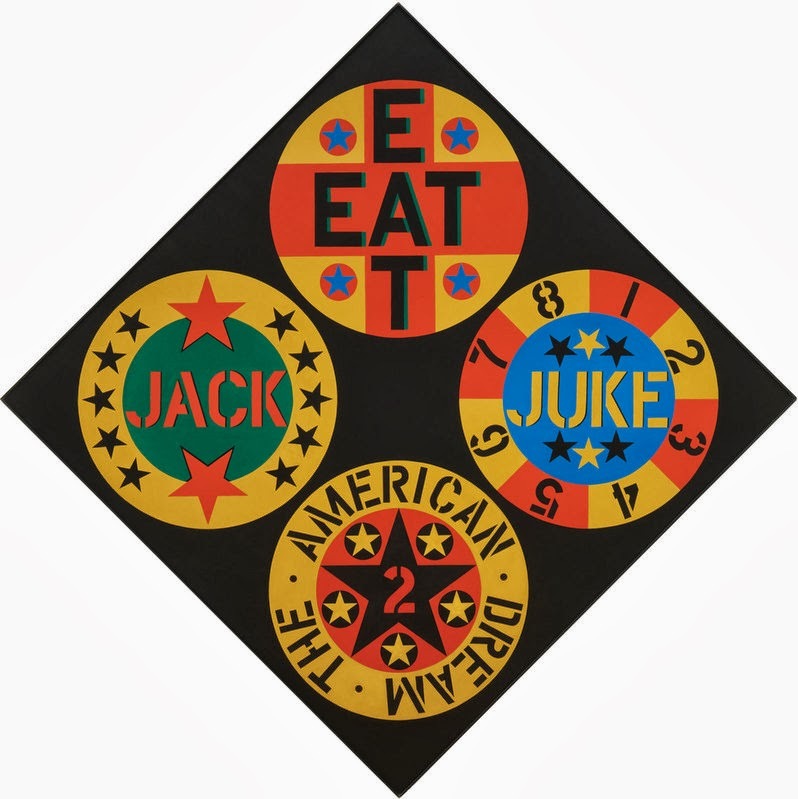 “Robert Indiana: Beyond Love,” organized by Barbara Haskell. 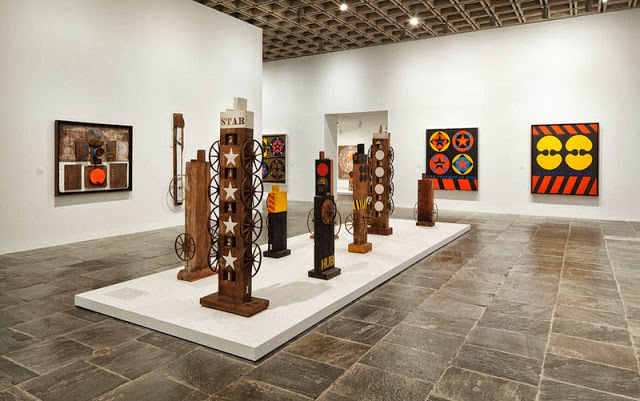 The Whitney Museum, New York, NY. Through January 5, 2014. Wonderful article on Indiana! It provides an insight to the artist's motivations behind his creations.